Born in Detroit, Michigan, Chuck McPherson spent his formative years surrounded by modern jazz masters, including his father, the great Alto Saxophonist Charles McPherson, Sr. Chuck grew up watching his dad make records with legendary composer and bassist Charles Mingus. His career began at age 16 as a drummer, vocalist and songwriter in jazz, R&B and rap. A student of master drummers Billy Higgins, Max Roach and Art Blakey, Chuck is a gifted and versatile percussionist. He swings with distinction and has a rare and professionally recognized mastery of brushes. 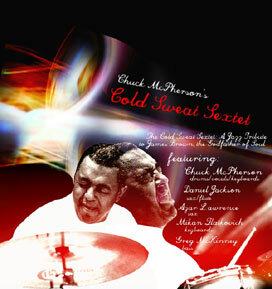 Chuck McPherson has toured with contemporary musical greats Freddie Hubbard, Roberta Flack, Harold Land and many others. He has performed in collaboration with poets, actors and symphonies. Staff drummer for Sugar Hill artists, the preeminent rap record label, Chuck has worked with some of the most vibrant artists in rap and contemporary music. True to the spirit of innovation, he pioneered blending hip-hop and jazz in 1984 with the single Shahid, which rose to the top of British soul charts. His self released album, "Soul Jazz Collaboration" hit #1 in Acid Jazz on the web site MP3.com.